At a time when many aspiring Japanese filmmakers spend years working on other people’s movies before having a chance to make one of their own, getting your first feature into cinemas at the age of 22 is no small achievement. 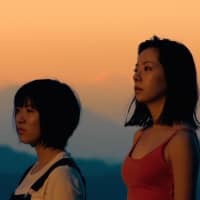 Writer-director Aya Igashi was already being touted as a name to watch when her graduation film, “Tokeru,” was screened in the Cinefondation section of last year’s Cannes Film Festival, on the recommendation of Naomi Kawase. With “A Crimson Star,” she makes good on that promise. It’s a distinctive and heartfelt debut, where even the quirks are endearing. To say that it feels like the work of a young director may sound like a backhanded compliment, but it’s that same quality that makes it so refreshing. At heart, it’s a story about two emotionally damaged people who find solace in each other’s company, even if the bond they forge is both taboo and possibly toxic. Fourteen- year-old Yo (Miku Komatsu) develops a crush on one of her nurses during a hospital stay, so she’s dismayed when the lovely Yayoi (Yuki Sakurai) quits her job and starts turning tricks instead. But after getting sexually assaulted by her mother’s boyfriend, it’s Yayoi she turns to for help. Reluctantly at first, the older woman agrees to let Yo stay with her, and as they spend more time together the lines in their relationship become increasingly blurred. While initially it’s Yo who needs emotional support, later their roles are reversed. An ultrasound photo buried at the back of Yayoi’s underwear drawer indicates the real reason for her self-destructive behavior, and the depth of the emotional void she’s trying to fill. Igashi rather rushes the exposition, and her choice of symbolism — paragliders, an abandoned observatory that Yayoi sneaks into at night — isn’t especially subtle. But when she stays focused on the complex relationship between her two main characters, “A Crimson Star” is riveting. Sakurai gives a terrific performance as the brittle, chain-smoking Yayoi, a woman whose emotional scars have become her protective armor against the world. Meanwhile, Komatsu’s relative inexperience as an actor ends up working in her favor: She’s so natural as the inarticulate and clingy Yo that she makes her more seasoned co-star Yuki Ohara (playing school friend Daisuke) seem mannered in comparison. In a pivotal sequence, Yo and Yayoi are shown silhouetted against a window, then sink into the shadows, with only their whispered voices betraying what’s happening. It’s wonderfully suggestive, and also typical of the film’s overall discretion. Igashi recognizes the difference between nakedness and intimacy; when Yayoi is seen servicing customers in her car, the focus is always on the character rather than her body. Igashi has said the story is rooted in her own experience, and “A Crimson Star” has the kind of emotional honesty that can’t be faked. It doesn’t judge its characters, or subject them to public scrutiny. As the final scene makes clear, love may only be a temporary salve for these two, but it’s all they’ve got.